Because of the distances and the geography involved, we begin in Bangkok and finish in Luang Prabang. Tours to Laos, like those to Cambodia, take on a little bit more adventure due to a less developed infrastructure than its neighbours but like Cambodia, the charm of the people will more than compensate for that. 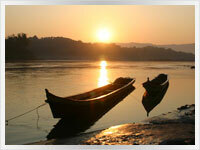 As well as a comfortable flight to begin with we will experience real Laos with some truly memorable local bus rides. We start with a flight from Bangkok to Pakse before bus trips to Savannakhet and Tha Kaek to experience the real Laos without the tourist hordes. We then visit the most laid-back capital in the region of Vientiane and travel through some of the best scenery in all S.E. Asia along the way to, in and from Vang Vieng. Then finish in one of the super highlight destinations in all S.E. Asia of Luang Prabang. All this while relaxing in comfortable accommodation along the way. ACCOMMODATION = (3 star hotels x 13 nights; 2 star hotel x 1 night). Tonight our experience Laos small group soft adventure tour package will stay in; BANGKOK - Our Laos group tour vacation package officially starts when we check into our riverside Bangkok accommodation. A welcome dinner will be had in the evening. D.
If you arrive early enough your extra time could be spent visiting the enormous Chatuchak weekend market and/or, Wat Phra Kaew & the Grand Palace, Wat Pho, Wat Arun, MBK or Siam shopping centres or avoid the traffic on a public transport boat ride with the locals on the Chao Phraya express to some local shops/markets in Nonthaburi. OR? Maybe just lay back and have a traditional Thai Massage. A month in Bangkok wouldn't allow you enough time to see it all. BANGKOK - A free day to recover from any jet lag by the pool or get out and about to experience what this truly amazing city has to offer with your tour coordinator available to point you in the right direction whether it be sightseeing and/or shopping as well as a real Thai meal experience that can only be had in Thailand. Pakse now has a bridge over the Mekong to Thailand meaning it has grown into a bit of a trading town also. But with usual Laos laid-back style it makes for a more than relaxing stay. Some minor attractions in town are a small History museum and the usual array of Wats. But only forty six kilometres out of town is the reason so many tourists now arrive in Pakse. World Heritage listed Wat Phu Champasak is one of the highlights of Laos. This fifth century Khmer religious complex is tiny in comparison to the Angkor kingdom but is no less intricate in design. If you can't make it to Angkor then Wat Phu Champasak is a worthy alternative. Last but not least Pakse has a few great restaurants with one in particular, in our opinion, being one of the best restaurants in all Laos. Thai, Laos, Western and Vietnamese food are on offer with the Vietnamese curry noodle salad being one of the best choices, to begin with. B.
PAKSE - A half day tour of Wat Phu Champasak is included today. Apart from that, you may take a stroll to the local "mall". Another eye opener for first time Laos visitors. B.
PAKSE - A free day in Pakse to take a stroll with a good restaurant and a Beerlao never far away. A true highlight of Laos just without the glamour. B.
Tonight our Experience Laos in comfort group adventure tour package will stay in; SAVANNAKHET - A chance today to get that real Laos bus experience. All aboard with the locals for a day you will always remember. If not for the slow speed bus that stops for every waving hand and cargo along the way then at least for seeing the most barbecue chicken on a stick, where vendors at bus stops may actually outnumber bus passengers. SAVANNAKHET -Savannakhet is another of those quiet Laos riverside towns where again one of the favourite pass times is having a Beerlao beside the Mekong. Traces of the French still remain with colonial-era buildings lining some of the quiet wide streets. For the most part though just strolling around this charming town is one of the best ways to enjoy it. An outdoor plaza, eating market is another great for an early evening drink & dinner with the locals.B. Tonight our Laos group tour package will stay in; THA KAEK - Heading further north today on a shorter bus trip we will have an overnight stop in another Mekong riverside town to break the long journey to Vientiane. Tha Kaek sees few tourists but has enough charm for an overnight stop and another chance for a Beerlao in an atmospheric riverside restaurant. B.
Tonight our Laos adventure holiday will stay in; VIENTIANE - Another shorter drive today sees us in what surely is South East Asia's smallest and sleepiest capital city. 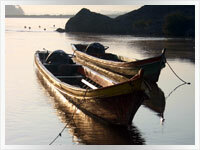 With only a little bit of the usual Asian big city hustle and bustle beside the Mekong lies Vientiane. Sightseeing begins with a short Jumbo, (Tuk Tuk), ride to the most important temple in Laos of Wat That Luang. Again, like all of Laos, it will be the charm of Vientiane that wins you over the most. No meals. VIENTIANE - A full day to explore the Laos capital. Don't miss the Morning Market, (open all day), which today resembles a shopping mall rather than the wet market of yesteryear. iPhone anyone? B.
Tonight our Laos group adventure tour package will stay in; VANG VIENG - Today we travel by bus to the scenic town of Vang Vieng beside the Nam Song river for an overnight stop to break the long journey to Luang Prabang. Vang Vieng is the most scenic town in all Laos with its limestone karst topography that makes a very pleasant place to have a relaxing stopover. Vang Vieng has turned into a bit of a backpacker party town so that's a choice as well as a relaxing swim in the hotel pool. Relax or party? Relax is our advice after a fairly long day and another to follow. B.
Tonight our Experience Laos in comfort small group holiday tour package will stay in; LUANG PRABANG - By bus today with some stunning scenery along the way will see our Laos group tour in the wonderful Unesco World Heritage City of Luang Prabang. The best way to see Luang Prabang is with leisurely strolls. Cooking courses can be found at: Tamarind; Tamnak Lao Three Elephant Cafe; Massage and Spa's are another way to enjoy Luang Prabang for the not so energetic. Markets and other great eateries will see you get enough nourishment to complete the task at hand whatever you decide on. LUANG PRABANG - A half-day tour with a local operator today will include a trip on the Mekong to visit the spiritual caves of Pak Ou, the beautiful Kuang Si waterfall and a local village or two among other interesting places. B.
UANG PRABANG - After visiting the hard to get to places we now have a totally free day to explore all the nearby attractions at leisure. Our Experience Laos small group soft adventure tour package is officially over when we check out of our Luang Prabang accommodation. An airport transfer is also included. B. You can now head home after experiencing real Laos. Some of those southern Laos bus trips will surely be what you are going on about for years to come. 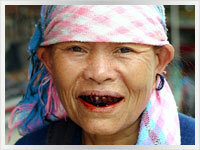 A true Laos experience that you will always treasure.